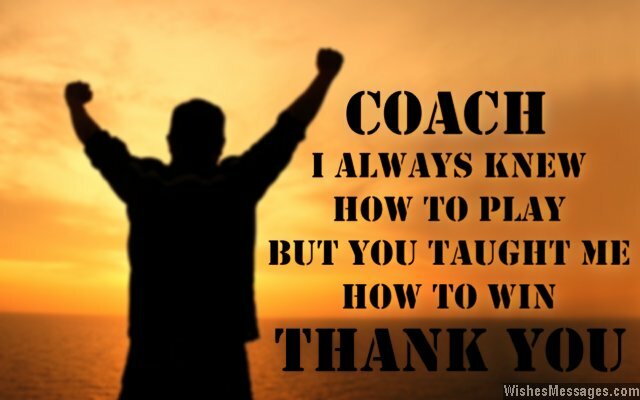 Thank You Messages for Coach: At senior level coaches may be recognized for their contribution but in other forms of the game they often go unnoticed on the sidelines. It doesn’t take a lot of effort to say thank you to your coach for the endless hours of encouragement, guidance, inspiration and motivation. Just write a sweet note on a greeting card to express your gratitude. You can even post your messages and quotes on Facebook or Twitter. These kind words of recognition of your coach’s contribution in your journey as a player or an athlete will mean a lot. Coaching can sometimes be very thankless because winning is credited to the players whereas the blame for losing is often put on the coaches – especially in team sports. Do your bit to give back to the coach who dedicates each and every day to make you a winner. 1) Coach… even when I said I CAN’T, you said I COULD. Even when I said I WON’T, you said DO IT. Even when I said I WILL LOSE, you said GO WIN. Even when I said I FAILED, you said WELL DONE. 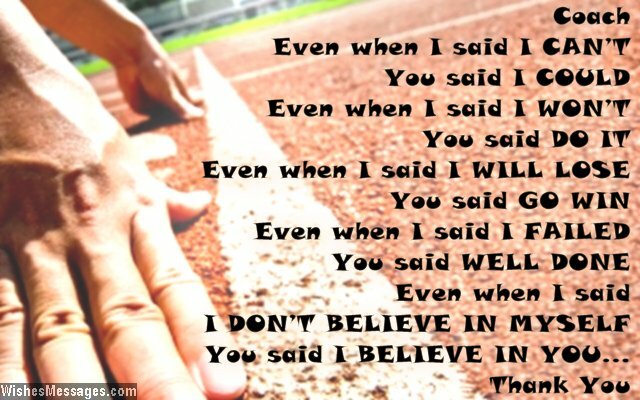 Even when I said I DON’T BELIEVE IN MYSELF, you said I BELIEVE IN YOU. Thank you. 2) My heart is my body’s engine but your inspiration is the fuel. Thanks coach. 3) Nothing can spoil my journey towards being the very best, as long as your inspiration fuels my zest. No one can come in-between be and victory, as long as I have a coach like you training me. Thanks. 4) Sweat and blood is what we give you, victories and trophies is what you give us. Thanks coach. 5) Coach… thanks for fortifying our forte and destroying our demons. 6) Only a coach like you can help us convert the bitter pain of sacrifice into the sweet taste of victory. Thank you. 7) Thanks for believing in me when I was down and out. Thanks for trusting me when even I had my own doubts. Thanks for pushing me to emerge as a champion – coach, you are my ultimate source of inspiration. 8) Even your most SUBTLE tips create the most NOTICEABLE impacts on my performance. Thanks coach. 9) You made me stronger with each passing day. You made me better in just about every way. You inspired me to become a winner, I will remember your words forever. Thanks coach. 10) Your motivation is like an aeroplane – it get us exactly where we want to be in the least possible time. Thanks coach. 11) I hate it when you pull me up for being slack, but deep down inside I know it will help me improve what I lack. I get annoyed when you try to push me beyond my limits, but deep down inside I know that’s the only way to cultivate a winning spirit. Thanks coach. 12) It is just amazing how you willingly take blame for my failures and give me credit for my success. Thanks coach. 13) I have dedicated my life to being a better athlete and you are my godfather. Thanks coach. 14) Training for gameday is journey that goes from pathetic to euphoric – thanks to a coach who is just fantastic. 15) I always knew how to play, but you taught me how to win. Thanks coach. 16) Dear coach… you are to us like how fuel is to fire. Thanks for lighting the fire within. 17) I would never have been ambitious if you hadn’t motivated to be audacious and ferocious. Thanks coach, you are glorious. 18) The ABILITIES and TALENTS of all the players in the team are pretty much useless until a coach like you brings it all together by helping everyone FOCUS on a common GOAL. Thanks coach. 19) My eyes may be mine but the vision I see is yours. Thanks coach. 20) Sometimes we hate you because your drills are nothing short of torture, but we still love you because you are prepping us for a glorious future. Thanks coach. 21) Every game I play is fuelled by two things – motivation to become a champion and an obligation to do justice to an exceptional coach. Thanks for everything. 22) We hate to train under a coach as ruthless as you, but deep down inside we know that it will get us through. Thanks coach. 23) On the facade you are tough and mean but a peak inside your real personality reveals that you are one of the best human beings we have ever seen. Thanks for everything coach. 24) My muscles power me, my heart powers my muscles, my mind powers my heart and your inspiration powers my mind. Thanks coach. 25) Just like how there is no substitute for hard work, there is no substitute to a coach like you. Thanks for everything. 26) For us, the difference between Good and Best is a coach like you. Thanks. 27) Coach, you trust my abilities and I trust your advice. No wonder I have continued to scale new highs. Thanks. 28) Everything from your drills to your strategies, has helped me decimate my enemies. Everything from your helpful tips to your fancy tricks, has helped my sporting dreams tick. Thanks coach. 29) Inspiration comes in various forms and from various sources, but in my life it is a five letter word, C-O-A-C-H. Thanks for being my inspiration. 30) We hate you when you put us through those merciless drills. But it becomes worthwhile when we experience victory’s thrill. Thanks coach. 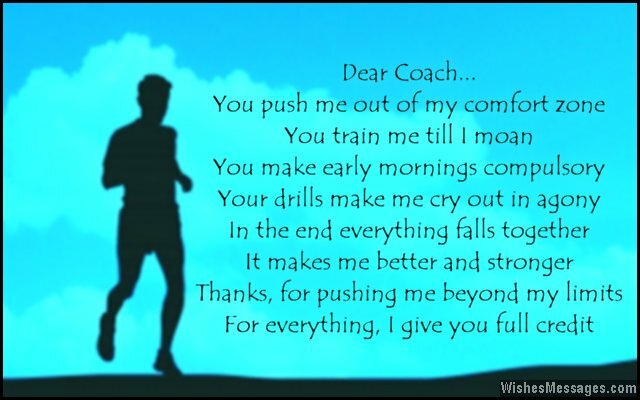 31) Dear coach… you push me out of my comfort zone. You train me till I moan. You make early mornings compulsory. Your drills make me cry out in agony. In the end everything falls together – it makes me better and stronger. Thanks, for pushing me way beyond my limits. For everything, I give you full credit. 32) Just like how the roots of my strength lie in hard work, the roots of my success lie in your guidance. Thanks coach. 33) I may be the one who does all the hard work, but you are the one who motivates me to do it. Thanks coach. 34) Coach, your motivation negates my worries, your compliments mean more to me than trophies. Thanks. 35) Ours is a strong relationship because it is based on focus and trust. There is only one thing we both want and that is to come first. Thanks for everything coach.